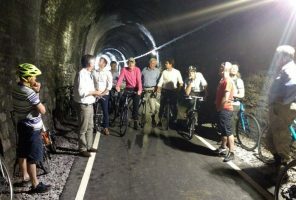 A new traffic free section of Lon Las Ogwyn between Tregarth near Bangor and Bethesda has opened. 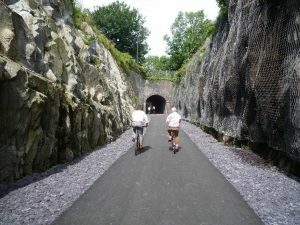 The route, part of NCN 82, now uses the old former railway trackbed and passes through the 275m long Dinas tunnel. 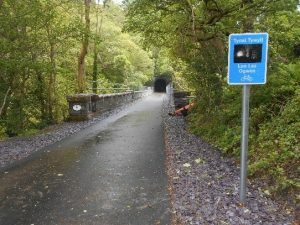 In addition to the tunnel and a viaduct over the river Ogwyn, RPL had previously been responsible for several bridges on the former railway from Bangor to Bethesda. Following a generous grant from the Railway Heritage Trust these were transferred to Gwynedd County Council who assembled a funding package to enable all the structures to be upgraded, lighting to be installed in the tunnel and a tarmac surface to be laid along the route. 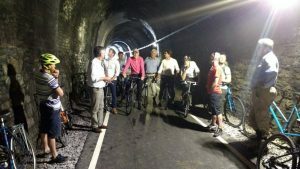 Sustrans has worked with Gwynedd CC for many years to improve Lon Las Ogwyn to enable people to cycle along a traffic free path all the way from the coast at Port Penryn, Bangor to Bethesda on the edge of Snowdonia national park – a picturesque ride of about seven miles length.